PORTLAND, Ore. — Lines for Life, a nonprofit working to prevent suicide and substance abuse, received a $1 million endowment from a prominent Portland family on Friday. Anne Naito-Campbell, the daughter of Bill Naito, announced the gift at a news conference. Portland Mayor Ted Wheeler, Multnomah County Commissioner Sharon Meieran and Lines for Life CEO Dwight Holton were also in attendance. "Today is a glorious day. I am so blessed to be able to give this gift to Lines for Life to help other people who are suffering from mental health crisis," said Naito-Campbell. "103 years ago my grandfather came to Portland from Japan and opened Naito Japanese Goods,” said Anne Naito-Campbell. “Today, my brother, my cousins and I are continuing the legacy my grandfather and my father began. With the sale of two of Portland’s greatest landmarks: Montgomery Park and the Galleria, we will be investing in Lines for Life to make lasting and important change in promoting mental wellness in Oregon." The $1 million investment will kickstart an endowment protecting and preserving the longevity of the organization, Holton said. “Lines for Life is a valuable partner in our fight against mental health stigma and suicide, and we look forward to working together to make sure the Naito investment helps Oregonians for generations to come,” said Wheeler. The Centers for Disease Control and Prevention reports the national suicide rate is at a 50-year high, climbing 33% since 1999. It's estimated 25,000 Americans died by suicide in 2016 alone. 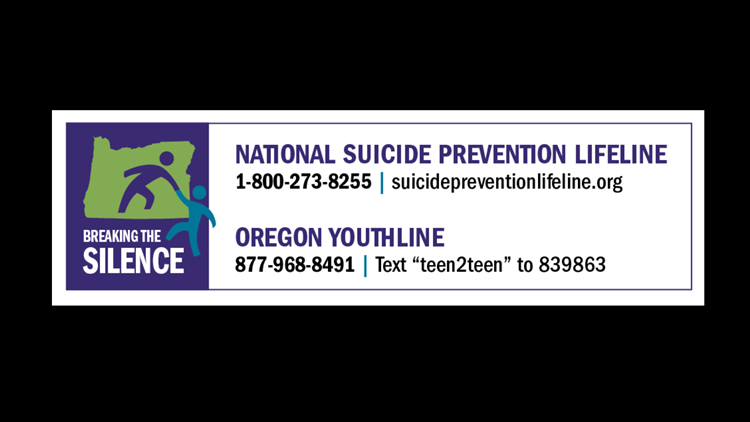 Oregon’s suicide rate is 40% higher than the national average. In 2017, 825 people died by suicide in Oregon, Wheeler said. Lines for Life says for every one suicide, 280 people consider it and do not go through with it. The organization de-escalates over 95% of its crisis calls. Last year they took more than 110,000 calls, texts and emails. Lines for Life is available 24 hours a day at 1-800-273-TALK (8255). Next week KGW will join more than 30 newsrooms from around the state in an unprecedented, weeklong reporting collaboration to shed light on suicide and its effect on the community. The project, known as "Breaking the Silence," will run from April 7 to 14 and involve newspapers, TV stations and student media organizations from across Oregon. Over the next week, KGW will have several stories focused on various aspects of the suicide issue in Oregon. Our coverage will begin this weekend with Straight Talk with Laural Porter. Holton and Emily Moser, Lines for Life YouthLine crisis line director, will be guests on the show, which airs at 6:30 p.m. Saturday, April 6, and 6:30 p.m. Sunday, April 7. Help is available for community members struggling from a mental health crisis or suicidal thoughts. Suicide is preventable. The Multnomah County Mental Health Call Center is available 24 hours a day at 503-988-4888. If you or someone you know needs help with suicidal thoughts or is otherwise in an immediate mental health crisis, please visit Cascadia or call 503-963-2575. Cascadia Behavioral Healthcare has an urgent walk-in clinic, open from 7 a.m. to 10:30 p.m., 7 days a week. Payment is not necessary.